Gordon Dale Poll, age 85, of Caledonia, went to be with his Lord on Monday, August 20, 2018. An Army veteran, Gordon proudly served his country during the Korean War. 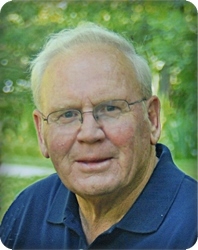 He will be lovingly remembered by his wife of 62 years, Winnie; his sons, Steve (Beth) Poll, Kurt (Lisa) Poll; grandchildren, Anna (Feliciano) Gandara, Jan (Ryan) DeWitt, Eric Poll, Kristena, Ashley, Maria, Emily, Justin Poll; great grandchildren, Eli, Vivian DeWitt, Lucia Gandara; sister-in-law and brother-in-law, Deana (Don) VanderMeulen, and Frank (Gert) Workman. The family will greet visitors on Friday, August 24, from 2 - 4 and 6 - 8 pm at Stroo Funeral Home, where the service will be held at 1 pm Saturday, August 25, with Rev. Merle Buwalda officiating. Interment will be in Dutton Cemetery. Memorial contributions may be made to World Renew.